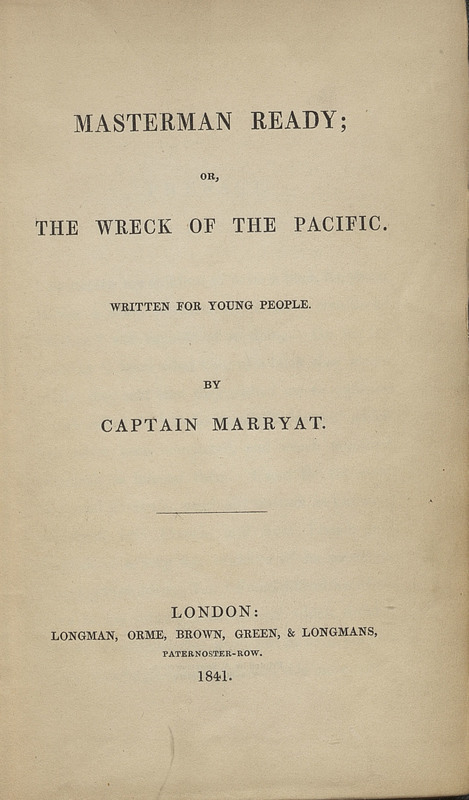 Marryat, who had served as an officer in Britain’s Royal Navy during and after the Napoleonic Wars, helped to popularize the genre of seas stories. Like Swiss Family Robinson, Marryat’s Robinsonnade was written for his own children and features a family with four children and their servant stranded on an island. In addition to the family members, an old and experienced sailor is shipwrecked on the island. Like the original Robinson Crusoe, Marryat’s novel features moral lessons based on the religious practice of those stranded on the island. Masterman Ready and Marryat’s other novels are often associated with British imperial sentiments popular during the Victorian era.